Today, I'm sharing with you Kid Start Spanish, a full immersion program for children up to 7 years old. This program can serve two purposes: to teach your child Spanish, and to teach your Spanish-speaking child to read. 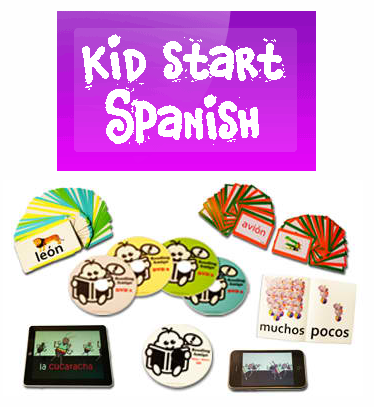 Kid Start Spanish (KSS) is an introductory program for families teaching their children Spanish. The methodology for this particular course relies heavily on repetition, memorization, and visual cues. It is a good way for parents who do not speak the language to help their children learn key words. But I think that it would be best suited as a supplement for Spanish-speaking families who wish to expand their child's vocabulary. Like Sesame Street, the scenes are fluid and combine live and animated segments to help capture and hold your child's attention. Text is included on the screen but the words fade into the scenes visually linking the two together in a child's mind. One of the neat aspects of the videos are the famous landmarks from around the world that are used as background scenery for some of the shots. This gives the program a global feel and helps children begin identifying these landmarks at an early age. They've also included quality Latin music from around the world using real instruments played by professional musicians. Altogether, it's a nice introduction to culture and geography, which are important for language acquisition, in my opinion. The program also helps Spanish-speaking children to learn to read in Spanish using memorization techniques and sight-recognition, though I would be careful about this as it does not teach phoenemic awareness or blending skills, which I think are important skills for reading unfamiliar words. It is designed to be taught in daily, 20-minute increments over a 30-week period. KSS relies heavily on technology and included in the program are 4 sets of flash cards, 4 DVDs, a book of opposites, a music CD, a memory card game, and an instruction sheet outlining in English and Spanish how to use the materials. The company has also developed mobile videos and iPhone/iPad apps to accompany the lessons. I have not seen or used these, so I can't speak on them, but if you have, feel free to leave a comment below. The heavy-duty flash cards and DVDs are grouped by theme: body parts, food, shapes, colors, barnyard animals, etc. and should be used in conjunction with the themed DVDs. I especially love that all the materials are printed in the USA using soy-based, recyclable inks that are safe for babies and older children. This program is available for just under $115, broken into three monthly payments. You can learn more about the program and even watch a video review on their site to get a better idea of the materials. Disclosure: I was sent a sample of the program by Kid Start Spanish for review purposes. All opinions are my own. I was really surprised to find that my son really loves the app. We use it mostly in the car so after pre-school he'll go in and practice words he learned that in English. I didn't realize that's what he was doing until a couple days ago. The apps follow the program pretty closely but the nice thing is they're interactive and u can jump right to certain categories. I just heard they might be coming out with a second app, because people are asking for it, we'll see. Thanks, Jessica, for sharing your experience!